One of the physical properties tests that’s done on core samples (from the working half) from Brothers volcano is thermal conductivity. What we’re trying to determine with this test is how capable the rock is at transferring heat. Why is this significant? Well, the temperature probe data that we gather doesn’t give us a complete picture of the site- it just tells us the temperature at one brief moment. However, when we combine both the temperature probe logs PLUS the thermal conductivity measurements, we see the bigger picture, as in how much heat the whole volcano is producing. HEAT is a significant factor during this expedition, as it is a fundamental process that drives fluid flow, and one thing we are investigating is the movement & impact of hydrothermal fluids in this system. 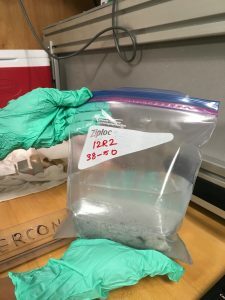 Kannikha Kolandaivelu, a final-semester PhD candidate at Virginia Tech’s Department of Geosciences, walked me through the steps to getting a thermal conductivity measurement. First, the rock sample is saturated in seawater anywhere from 2-12 hours. To ensure the rock is completely saturated, it’s placed in a vessel that has a vacuum pump attached so that air is constantly being pulled through, basically pushing water molecules into the pore spaces of the rock. Vacuum pump setup. The rocks are in bags of seawater. 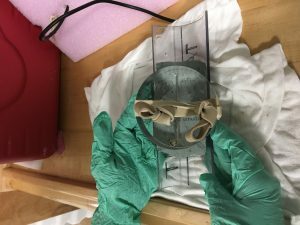 The saturated sample is then placed in a “boat” (made of a plastic core liner) that cradles the rock during the measuring conductivity process. 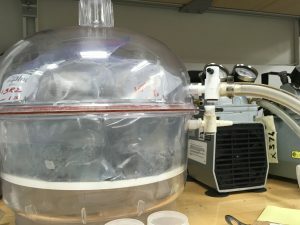 A thermal conductivity puck, with a thermistor and heating needle embedded, is placed on top of the rock sample and secured using wide rubber bands. Sometimes the best equipment is the simplest! Once secured, Kannikha squirts seawater between the puck and the rock surface, because the water improves contact between the probe and the rock sample. The electrical connector is then attached to the puck, with the other end at the thermal conductivity console. Thermal conductivity puck attached to rock sample, all sitting in the plastic core liner boat. Next, Kannikha pours enough seawater into the thermal conductivity vessel- in this case, a small Coleman cooler- to cover the probe-sample contact surface, which represents in situ conditions.She then places the boat into brackets at the bottom of the cooler, and surrounds the boat with styrofoam pieces, all in the name of stability. 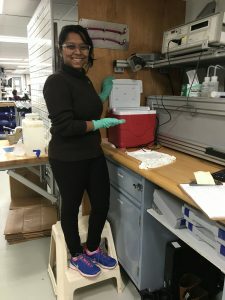 She covers the sample with another piece of styrofoam, closes the lid of the cooler, and turns on the computer to start taking measurements. The system takes a set of 4 measurements over a 45 minute to 1 hour time frame. Once we have these thermal conductivity measurements, along with lots of other data, we will be able to have a better understanding of the processes that occur in this hydrothermally-dominated system at Brothers volcano!